Oh I, oh, I’m still alive… and playing drums…. let’s play Alive by Pearl Jam from the Trinity Rock & Pop Grade 5 Syllabus. Full disclosure is necessary here… I love this song! The first Pearl Jam Album, Ten, totally blew my mind & I spent many hours, days, weeks, years doing my best impersonation of original Pearl Jam drummer Dave Krushen. If I ever want to remind myself of why I love playing drums, I just put this song on and jam along… nothing beats drumming along to your favourite songs! Is Your Bass Drum Alive? One of the main areas under examination with this song is the bass drum. Specifically playing the bass drum cleanly and consistently on the 16th notes in between the 8th note hi-hat. Hopefully you’ve been working on this in the lead up to grade 5 & should be comfortable with it before approaching this song. There was a little bit of 16th note bass drum at grade 4, but this is the first time where it’s happening all the way through a song. As always, if you’re in any doubt, slow down the tempo to around 50bpm and work on the grooves slowly until you find them easy to play & then bring them up to speed & beyond. It’s always good to learn to play things faster than you actually need to play them so that you are relaxed when you playing them at the necessary speed… playing at your top speed all the time is really taxing! Are Complex Fills Keeping You Awake At Night? A number of more complex fills are featured throughout the song. 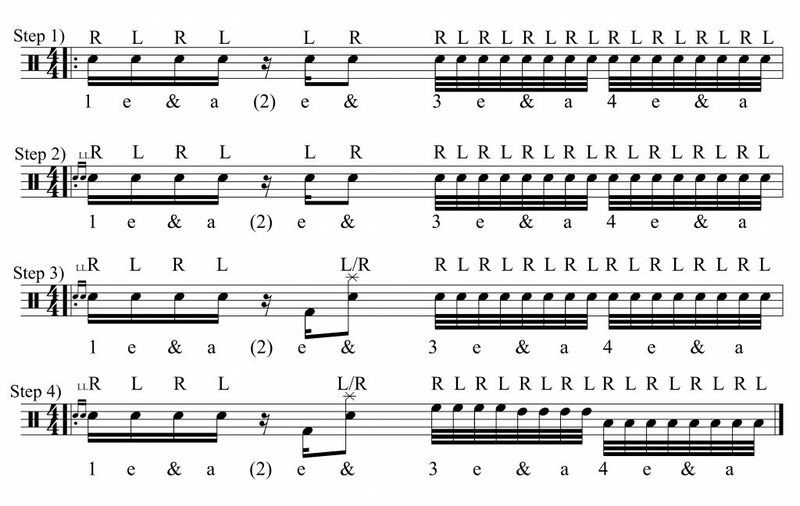 These fills include items such as the drag rudiment, the bass drum, 8th & 16th note rests & 32nd notes. Let’s not panic…. The drags… you’ve been playing drags in songs since grade 3, back then they were mostly stand alone, now we’re just putting them on the front of 16th note fills. All of these can be played using your preferred sticking; for right handed drummers, that probably means your left hand will play the 2 grace notes and your right hand will land the main note on the beat. Make sure that your timing of the 16th notes is accurate, the first note after the 2 grace notes must be smack on time, don’t delay it to make room for the grace notes. Note that I prefer to count 16th notes when I’m playing 32nd notes… you can count all the 32nd notes if you want, but at higher speeds it’s not practical. I prefer to count the 16th note & feel the 32nd notes between them… if it’s a more complicated 32nd note pattern then I may count all the 32nd notes while learning it & I’d be going really slowly. The Complexity… When I’m learning a complex fill the first thing I learn to do is play the rhythm of the fill on one surface, normally the snare drum. When I can count it & play it accurately then I’ll start worrying about any sticking patterns or flams & drags or bass drums that need to be applied & then moving it around the kit. Oh I, Oh, I can play this fill! Step 1: Just play the rhythm of the fill on the snare and count it out. I don’t tend to count beat 2 when I play this fill, which is why I indicated it in parentheses. You may want to count it. Don’t move on until you’ve nailed this step! Step 2: Add in the drag at the start. Make sure beat one stays on beat one. Step 3: Substitute the snare drum on the e of 2 for a bass drum and add the crash to the snare on the & of 2. Step 4: Add in the Tom-Toms to beats 3 & 4. Wasn’t so bad was it? Is It 7/8 O’Clock Yet? The instrumental portion of the song features 3 bars in 7/8 interspersed with bars of 4/4. You can choose to count these bars either in 7/8 or continute your regular 4/4 counting as follows. Oh I, Oh, I can play 7/8! You might find it helps you to make that move smoother too. When I was practicing this song, I noticed that I was rushing on the last 2 notes of this figure. I think it was because we play a similar figure just before hand as a bar of 4/4. The rest between the last 2 groups of notes is only a 16th note in that figure and not an 8th note. To remedy this problem of rushing, I start bouncing the heel of my left foot up and down on the hi-hat stand in time with the 8th notes on the bar before the 7/8 figure starts. I then used the physical feedback from my foot to help me keep my timing while playing this figure; hitting the first of the last 2 sixteenth notes at the same time as my left foot heel hits the floor on beat 7 (or 4, if you’re counting that way). It actually helps with the spacing of all 3 groups of 16th notes as you’ll have 1 heel hit between each group & the next group starts on the next heel hit. Try it, you may find it a useful time keeping tool. Now to the part of the song I don’t like… but only for the Trinity version. The suggested groove for the bridge just feels wrong to me and clashes with what the rest of the band are playing. Now in my video. I played it as suggested and how it’s played in the demo version of the song that trinity supply. I struggled with it though, it just didn’t feel right to me, my body just wanted to play something different. Oh I, Oh, think this groove is better for the bridge! This is similar to the groove that Dave Krushen played on the original & it meshes much better with the backing track. I don’t know how strict Trinity are when marking the exams. Will you lose points if you ignore their grooves and play something more suitable? During the bridge section you are told to continue in a similar fashion, hopefully this is similar enough that you don’t lose marks for it… if in doubt, force yourself to play the wrong sounding groove they suggested. Hopefully you’ll enjoy playing this song as much as I do. For the guitar solo at the end of this song I decided to let go and enjoy myself. Lots of bass drum, crashes, & that extra 32nd note fill – yours big fill doesn’t have to be 32nd notes. I was just feeding off the energy of the song and I know the original version gets real noisy at the end with lots of crashes, snare drums on all four beats and bass drums on all the 16ths in between… I didn’t go that far… if I record it again I might! The 2018 version of the Trinity Grade 5 Rock & Pop book is great to work through if you’re around 3 years into your drumming career. You don’t have to take the exam to benefit from the book. The songs are great to work on & fun to play and will help to improve your drumming. In Singapore you can find the book at Robert Piano – Paragon Shopping Centre (and probably their other outlets). It’s also available from Amazon if you’re happy to pay the shipping! Don’t forget to check out our youtube channel & subscribe for more videos!